Welcome to another edition of the WNR. It’s going to be a light one this week, as while we have a big announcement from Apple to cover, that was pretty much it. Still, it gives us plenty to talk about this week, so let’s not waste any time. So the big news of the week was Apple’s entry into streaming video courtesy of their upcoming Apple TV+ service. First of all, let’s talk about what it isn’t. It isn’t really a Netflix rival, at least not yet, because Apple TV+ will only host original content that Apple themselves have produced. So there won’t be any third-party licensed content that’s still the bulk of content on platforms like Netflix and Amazon. And even with relation to original content, Apple’s content spend of $1 billion is only a fraction of Netflix’s annual spend on original content, so Apple’s ambitions, so far, are much more limited compared to Netflix’s. Apple TV+ also won’t work on most of the non-Apple devices you actually own. While Apple is opening up Apple TV slightly, allowing it to work on selected smart TVs and even on the Amazon Fire TV, Apple TV+ won’t be accessible on your Android device, on your PC or in your browser. This could change at some point, but it looks like Apple wants the content on Apple TV+ to be mainly consumed on an Apple device (which is not surprising). Using unique content to draw users into the Apple ecosystem is one thing, but what Apple may be even keener to do is to keep the Apple TV hub relevant in the age of Roku, Amazon Fire and Google Chromecast. Apple can’t make their 30% off of Netflix if Netflix doesn’t think it’s worth having their app integrated into Apple TV, and Netflix won’t think Apple’s 30% money grab is worth it if Apple TV is not popular enough. Jenifer Aniston, Reese Witherspoon and Steve Carell, will help grow the Apple TV user base. Or at least grow it enough to make Apple TV an essential platform to be part of. This talk of Apple reminded me of an old news story from way back. Way back as in when Steve Jobs was still alive, and when Toshiba’s HD DVD was still trying to beat Blu-ray. Jobs said then that Blu-ray was a “bag of hurt” and despite Apple being a member and a board member of the Blu-ray Disc Association, Apple never did bother to include a Blu-ray drive with any of their computers. Now Apple is getting into video distribution having skipped discs entirely, and this probably means something for discs (and not in a good news kind of way). 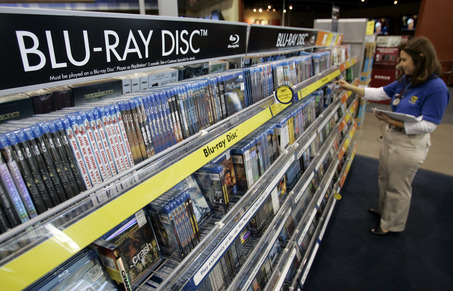 But discs do still have a place (anyone who regularly tries to download high-quality 4K content will know this is the case), and they will be around for a while yet, even if they are no longer the default go-to for most people. What do you think? Do you still use discs? Let us know by voting in our latest poll. That’s all I have for you think week. Let’s wait and see what the next week brings us. This entry was posted on Sunday, March 31st, 2019 at 4:07 pm	and is filed under DVD, Electronics, High Definition (Blu-ray/HD DVD/4K), News Roundup, Video Technology. You can follow any responses to this entry through the RSS 2.0 feed. Both comments and pings are currently closed.